Have you seen those snazzy blue Bublr bikes cruising around Milwaukee? They mark an exciting first for Milwaukee…a bike sharing program that makes bike riding readily available to Milwaukee residents and visitors. Juli Kaufmann of Fix Development joined Bruce Keyes and Barry Mainwood as they led the charge to establish a bike sharing program in Milwaukee. Together they created Midwest Bike Share, Inc., a nonprofit organization that, in cooperation with the City of Milwaukee, developed and implemented a bike sharing system – Bublr Bikes – to provide short-term bike rentals accessible to all Milwaukeeans. “Accessible to all Milwaukeeans” is a key tenet of Bublr Bikes. The intent is to be widely and easily accessible throughout the city including within low-income neighborhoods (LINs) and communities of color, which have been traditionally underserved and/or underrepresented in national and international bike sharing systems. To help ensure the success of that tenet and the overall success of the entire program, Juli Kaufmann chairs Midwest Bike Share’s Equity and Fund Development committees respectively. Besides striving to ensure affordable, easy access to bike stations, Bublr Bikes also is committed to a diverse workforce and encouraging teens in low-income communities to learn bike repair and maintenance skills and gain valuable work experience. Bublr Bikes is partnering with the Boys & Girls Club of Greater Milwaukee and DreamBikes to teach teens how to fix and maintain bikes, plus additional skills specific to the bikes used by Bublr. The map below highlights where the current bike stations are located. For an updated list, click here. 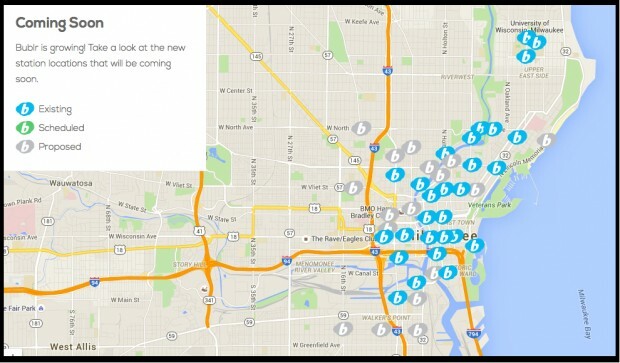 Existing and proposed Bublr Bike stations in Milwaukee, WI as of October 2015. Bikes can be rented for short termuse for such outings as grabbing lunch, traveling to a meeting, or touring part of the city. There are two ways to use Bublr Bikes, depending on how often you intend to use the bike: Single Ride orMonthly Pass. Go to any Bublr Bike docking station. Purchase a $3 Single Ride Pass with your credit card. Take a bike and ride for up to 30 minutes. Return your bike to any docking station and check it in. Buy a $15 Monthly Pass at BublrBikes.com. You’ll receive a Bublr Bikes key fob that you can use to “swipe” at any Bublr station. Take a bike and ride for up to 60 minutes. Monthly Pass holders can take unlimited 60-minute rides for the month. If any of your trips are longer than 60 minutes (from checkout to check-in), an additional $3 fee for each additional 30 minutes will be charged to your credit card. In 2016 the system is scheduled to expand to as many as 35 stations with up to 300 bikes, including a station at the Anodyne Coffee Café across the street from the Clock Shadow Building as well as stations in Bay View, along Historic Martin Luther King Dr. Drive, on S. Cesar Chavez Dr., in the Menomonee Valley, and on the East Side. And by 2017, Bublr plans to have more than 100 stations installed with 1,000 bikes. This includes additional expansions into low-access neighborhoods on Milwaukee’s near north and near south sides plus the suburbs of West Allis, Wauwatosa, and Shorewood. 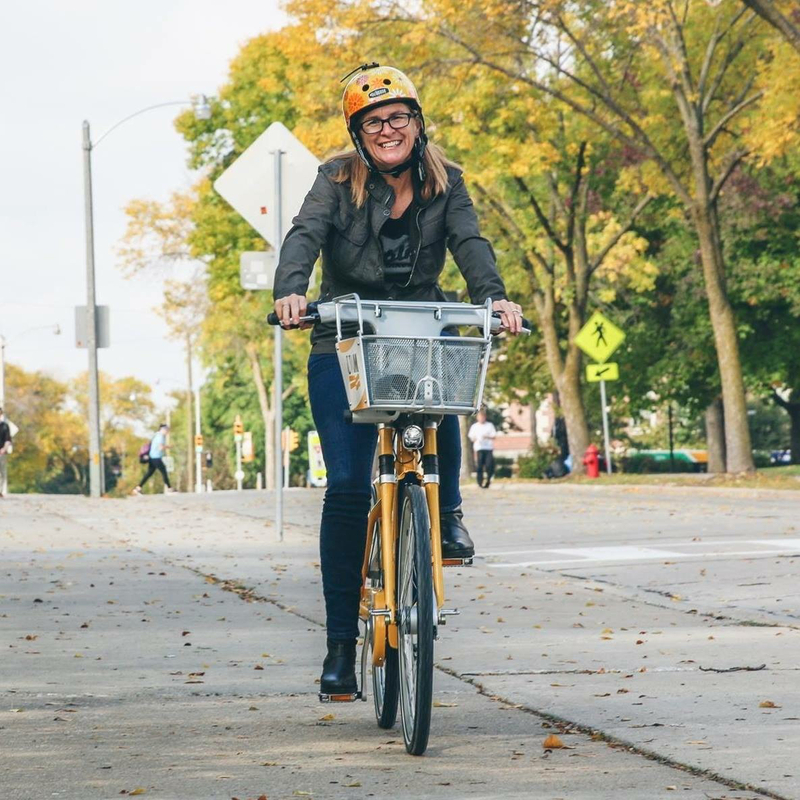 Juli Kaufmann riding a UWM Bublr Bike, October 6, 2015.